In addition to the many, many positive Google, LinkedIn and Facebook reviews we've received since 2007, we’ve gotten stellar personal testimonials from many of our clients over the years. The reason we keep getting these reviews is simple: We don't stop until you're completely satisfied with our work for you. And then, even after we're done - we will continue to support your website through secure, state of the art hosting, technical support, and educational workshops to help you grow your business. We're here for you from start to finish, and then will be helping you along the way after you are ready to launch your new idea on the web! 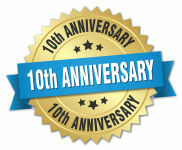 Please take a moment to review some of the many testimonials we have received over the years! Great service, careful and creative design, priced right! What else can anyone ask for? Thanks Rockland Web Design. Rockland Web Design was such a pleasure to work with. Rose Memorial Library needed something more modern and interactive and the new website was everything we could imagine. Rockland Web Design really listened to our needs and gave us a product we can be proud of. I would highly recommend them to anyone looking to make their web presence something special! Tom and Heather at Rockland Web Design are really great at what they do. They both went above and beyond for Dave and I and we are very impressed with the effort and the time they placed in helping us out, considering we are not yet their clients. It’s very rare nowadays to get this type of treatment and service from any business and we are very grateful! We highly recommend Rockland Web Design and look forward to hopefully doing business in the near future. Thank you. Tom and Chana at Rockland web design provided exceptional service. During our project they communicated effectively and in a very timely manner. The project was done on time and on budget and they over delivered. Our site was not created by them and they had to learn their way around and did so with skill. I look forward to many more project with Rockland web design. "Tom and I work together in several areas. In the area most related to his work, I switched to Rockland Web Design because I knew that we would work well together and that Tom was patient enough to hold my hand through my blocks around technical things. He has developed my site tremendously. I now have our talk shows instantly uploaded, my clients and sponsors of the show can pay through Pay Pal, and I use Google Analytics to track traffic to the site (I can even say words like Google Analytics which is progress for me!). We have more things planned with upcoming coaching products, etc. I feel more confident doing these cutting-edge things knowing that Tom will guide me through them. Yesterday, I visited Tom’s new office space in the Nanuet Mall (across from Bath and Body Works). Tom created a blog site for me, worked on my facebook page, and did a whole lot of other stuff . . .
so fast that I couldn’t keep up! Now, all I have to do is start blogging! second language – computer is his first! Rockland Web Design was the perfect solution to my website needs. They met all my requests very quickly. They were professional. I was impressed with how fast my website was up and running. It was affordable and well worth it. The price quoted was the final cost. They made it very easy to access. We at Valley Cabinets highly recommend Rockland Web Design. This is just a note to thank you and Patricia, Matt and the rest of you at Rockland Web Design for helping me get my website and blog launched. I was using a PC for paperwork before there was an internet, and only went on-line when the courts began to do business that way, about ten years ago. I was used to buying things on the web, but I never thought of promoting my own law practice that way until now. I have always relied on referrals, word of mouth and limited print advertising to keep my name and phone number out there. I am very pleased with how my blog has begun to show up on Google when you search for my name and "bankruptcy law”, and I expect that my website will not be far behind. Anyway, they are linked to each other, and should get people to where I want them to be. Thank you for your patience in helping me learn how to do the simple things you need to do to put things into your blog, liked snatching pages off the web, and linking to other websites. I will continue to rely on you to make my site more visible to the search engines, and I expect to try your patience further.